In 2011, the focus of the Heritage Doors was Wawa's rich mining history. The doors were created to accompany the collection of miining equipment on display at Mining Heritage Park (corner of Broadway Avenue and Mackey Street). 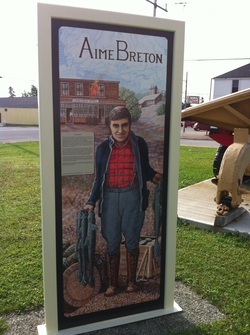 The location of the Heritage Doors across from the Lakeview Hotel in the Mining Heritage Park, was a perfect fit for telling Mr. Breton's colourful and tragic story. Through the eyes of both a researcher and a young child who remembers the tragedy of Mr. Breton's death, to me Aime was a true Algoma pioneer who lived life to it's fullest. He enjoyed the bounty of the land and its people. His soul will always be a part of Wawa. And his life ultimately resulted in the increased efficiency of search and rescue operations in Ontario.